The sausage I used here was from Teet's who partnered with the blog group 37 Cooks. It was a smoked garlic pork sausage - a spicier Cajun version of a typical smoked sausage. It added a nice amount of spice to the soup, but it wasn't at all what I'd consider spicy hot - just what I'm looking for in a black bean soup. The alternate title for this post could have been: What I Made for Dinner When I Came Home From the Hospital Way Too Hungry and Hadn't Planned Better. But that was sort of long. It all started with fondue cheese. You see, I got chosen to receive some cheese tools from Boska for review (not for this blog, although I might talk about one or two, anyway) and in order to properly test the tools, I got cheese from Emmi that I could use with those tools. Good deal, right? 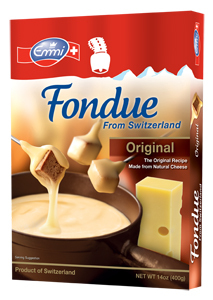 Among the wedges and bricks and wheels, I had this package of fondue cheese from Emmi staring at me. The idea is that it's got everything you need, so you just heat it up and start dipping bread in. But it's just under a pound of cheese, and I'm living alone while my husband is in the hospital. So when I came home late from the hospital, I thought it was time to do something with that cheese. But I wasn't in a fondue mood. Comfort food, on the other hand, sounded really good. Since the fondue cheese was formulated to melt smoothly, I figured it would make good mac and cheese. Yep, I'm wild and crazy, right? Since the cheese includes a bit of alcohol (as you would if you were making your own fondue recipe) the mac and cheese had a slightly "adult" flavor. Not overpowering, though. I didn't measure any of this, but it's so simple ... and it tasted pretty good. I cooked the macaroni in boiling salted water until it was done (a little al dente), then drained it and added some of the fondue cheese, let it melt, and added a bit more until it was cheesy enough. Then I added milk to make it creamy enough. Your idea of cheesy enough and creamy enough might be different than mine, but that's fine, too. Then I added a couple hand fulls of the frozen peas and mixed them in - not too long on the stove, because I like them best when they're still crisp. And that's it. The only thing that took any time was cooking the noodles - once they were done, it was a minute or two to finish it. I don't know if I'd buy the fondue cheese just to make mac and cheese, but if I had leftover cheese from fondue, this is a great way to use it up. I used the original fondue cheese but there's also a Gorgonzola one - I'm thinking that would also make a good mac and cheese, or maybe a sauce ... for steak, maybe? By the way, this reheats well, but it needed just a little extra milk to get the sauce creamy again. I adore mushrooms, I'll confess that right now. They adorn my pizza, they lurk in my stews, they sometimes sneak their way into salads. Some folk do not have the lust for mushrooms that I do - and I feel vaguely sorry about that, while I gobble up their share. If you're like me, you need to cook these right away. But be warned! Even those who are generally indifferent to mushrooms find these mushrooms enticing, no, addicting. These mushrooms may change your life. They are everything that mushrooms should be - fragrant, delicious, sizzling. Roasted well, their texture firms; they are chewy. They go together quickly enough that they can be made on the spur of the moment, and they're dead easy besides, so they're a feature in my kitchen. And quite possibly soon, in yours. Heat oven to 450˚ with the rack in the middle. 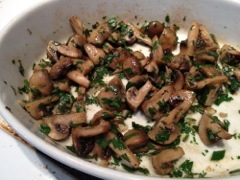 Toss mushrooms with oil, garlic, and salt and pepper in a 1 1/2 to 2 quart shallow baking dish. Dot the butter over the top. Roast, stirring occasionally, until mushrooms are tender and golden, and a bubbly garlic sauce has formed in the bottom of the dish - this takes about 15 to 20 minutes. Stir in the lemon juice, if you like it and also the parsley. Serve immediately, with crusty bread to sop up the juices, and be ready for squabbling about who got a bigger portion. A guest post from the lovely Madelyn from Karma Free Cooking. This recipe has been getting a lot of buzz around the folks at the SE Water Cooler on FaceBook. And I thought it might be of interest to your Cookistry readers too. This is the first recipe I did for my first official vegetarian Thanksgiving dinner since I started my blog, KarmaFree Cooking. And since then, it is still one of most popular recipes/posts there. This Butternut Squash Mac & Cheese packs a lot of nutritional punch and color from the butternut squash in the cheese sauce. You can substitute the squash for regular pumpkin. It works just the same. 4 ounces of Shredded mix of melting cheeses – Mozzarella, Asiago, Fontina, etc. 1. Peel, remove the seeds and cut the butternut squash or pumpkin into 2” pieces. 2. Roast the butternut squash or pumpkin on a baking sheet by adding a drizzle of olive oil, salt, pepper and a few sprigs of thyme. Massage the squash pieces so they’re seasoned all over. Roast in a 400F oven for about 45-60 minutes. Basically, until the squash is fork tender. 3. After it’s done, allow it to cool down a bit and puree in a food processor. 2. Bring a large pot to a boil for the pasta. 3. Meanwhile, start building the cheese sauce in a pot that’s big enough to accommodate the sauce and the pasta when it’s cooked. Over medium heat, bring together the milk, all the cheeses, the mustard, and pureed butternut squash. Season with salt and pepper. Your goal is to make a homogeneous cheese sauce where everything is blended and combined. As soon as that’s achieved. Turn off the heat and set aside. 4. When the water boils, salt the water generously and add the pasta. Cook until the pasta is tender but still firm. 5. Drain the cooked pasta and transfer to the pot with the cheese sauce. Mix well together. 6. Transfer to a buttered baking dish. Sprinkle with Parmesan cheese and some of the leftover cheese blend all over the top. 7. Bake for 20 minutes and then broil for 3 additional minutes so the top is crisp and nicely browned. Everything is already cooked, so you’re just heating everything together and browning the cheese on top. This recipe is delicious. The Dijon mustard gives it a different and grown-up taste. I hope you like it too. Tell me all about it if you try it. I can't seem to get enough pumpkin this fall! I'll probably be in pumpkin overload by Thanksgiving, but in the meantime, I'm enjoying all sorts of pumpkin inspired dishes. To compliment all my pumpkin dishes this fall, I thought a pumpkin flavored cocktail was in order. 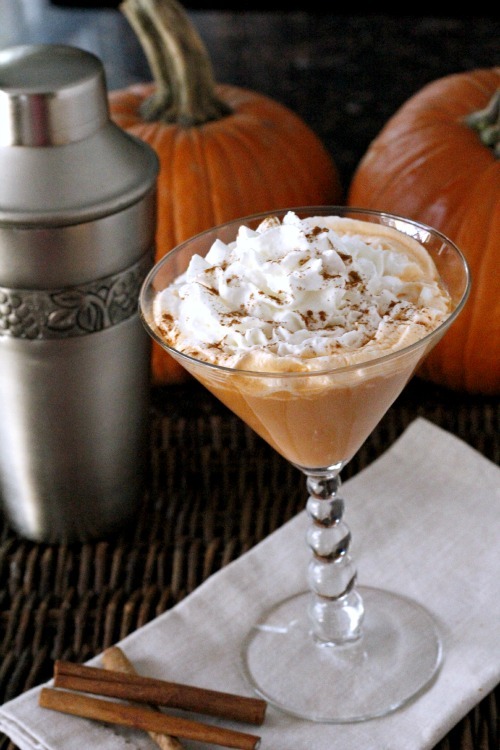 I love creating fun and quirky cocktails and this Caramel Nut Pumpkintini is no exception. It's like a dessert in a glass that will surely impress your friends. 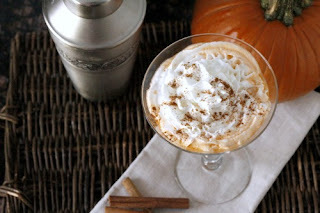 These Caramel Nut Pumpkintinis are easy to make and can easily be multiplied to make more than 1 drink. You could also serve these Pumpkintinis out of small glasses or shot glasses for a small treat. Hope you enjoy! 1. Place all ingredients in shaker with ice. Shake for about 10 seconds, then strain into martini glass. 2. Top with whipped cream and dash of cinnamon or pumpkin pie spice. Fun food that's a snap to make! I found a spider in my oven. Fortunately, it was a loaf of bread. 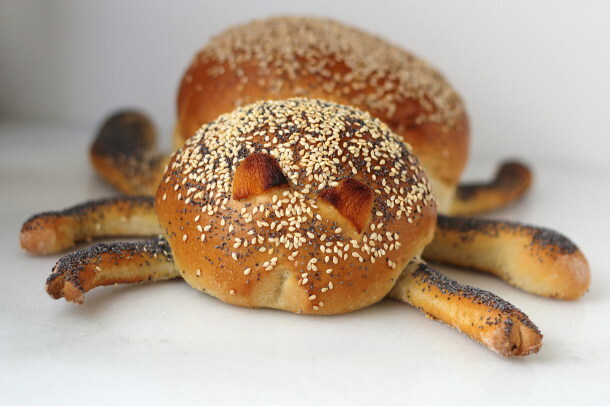 Yup, I got into the Halloween spirit and baked up a not-so-spooky spider. For the eyes, I used apricots, but any dried fruit would do. Or you could even do a design with the seeds to create eyes. And those seeds? I used poppy seeds, brown sesame seeds, and toasted sesame seeds - but really anything would do. Or nothing. I think this would look just as good without the texture of the seeds. Totally up to you. Put the water, yeast, honey, and yogurt in the bowl of your stand mixer. Whisk until the honey has dissolved. Add the 3 cups of flour and salt. Knead with the dough hook until the mixture is smooth and elastic.The dough should completely gather around the hook and the bowl should be clean. If there's a little "foot" of dough clinging to the bottom of the bowl, add more flour, a little at a time, until the dough gathers up that foot into the doughball. Add the olive oil and continue kneading until the oil is completely incorporated into the dough. Cover the bowl with plastic wrap and set aside until doubled in size, about an hour. Meanwhile, line a baking sheet with parchment paper and sprinkle cornmeal on the sheet. Flour your work surface and turn out the dough. Knead it briefly. Cut off a piece of dough that's about 1/4 of the dough, form it into a rectangle, and roll it to about 3 inches wide by 12 inches long. Using a pastry cutter, pizza cutter, or sharp knife, trim the edges, then cut it into 4 strips - this will form the 8 legs. Lay the strips on the baking sheet to form the legs of the spider. Stretch them longer, if you like or trim them so they're shorter - it's your spider, so make it look however you like. Take the trimmed pieces, and add them to the remaining unused piece of dough. Divide that piece into two, with once piece about 1/3 of the dough and the other piece 2/3 of the dough. Form those pieces into to rounds, and arrange them on top of the legs you formed to make the head and body of the spider. Make sure the two pieces are touching each other. Adjust the legs so they look the way you want them to. Cover the completed spider with plastic wrap and set aside until doubled in size, about 30 minutes. Meannwhile, preheat the oven to 350 degrees. Uncover the spider. If you're using several types of seeds, it's best to eggwash one part of the spider at a time. I eggwashed the legs first and sprinkled them with poppy seeds, then I eggwashed the body and sprinkled that with brown sesame seeds. Before you sprinkle the head section, cut the dried fruit (if needed) to the shape you want and apply them to the eggwashed head section. Then sprinkle the head with the seeds you choose. I used a combination of toasted sesame seeds and poppy seeds for the head. Make a vertical snip to create the mouth, and if you like, make small snips at the ends of the front feet for a little extra character. Bake at 350 degrees until the bread is nicely browned, about 30 minutes. Rotate the pan in the oven so it bakes evenly during baking, if necessary. Transfer the bread, still on the parchment, to a rack to cool. Once the bread is thoroughly cooled, remove the parchment. This is Angela, from Seasonal and Savory, sharing one of my favorite seasonal produce recipes: Hot Wing-Style Delicata Wedges. My cooking is heavily influenced by what I find at the Farmers’ Market or in my weekly C.S.A. share, and the winter squash are coming on strong right now. Delicata squash are a wonderful winter squash option because the thin skin does not need to be removed before eating. That makes them ideal for slicing and roasting, and in this recipe I have spiced them up with a sriracha sauce. Serve with blue cheese dressing for dipping, and you have a fun and healthy appetizer or side dish. Adjust the amounts in the sauce according to the heat level you prefer. I cut the squash both crosswise and lengthwise and then scooped out the seeds and sliced the quarters into small wedges. Preheat the oven to 375 degrees. Spray a cookie sheet with cooking spray to coat. Arrange the squash wedges on the tray, spaced slightly apart and with the skin sides down. Stir together the melted butter, sriracha, and smoked paprika, and brush the mixture on each of the wedges. You should have some of the sauce left over. Roast for 30-40 minutes, or until the squash is tender when pierced with the tip of a knife and the edges are just started to brown. Brush the warm Delicata wedges with any remaining sauce, and serve hot, with blue cheese dressing on the side. Thanks to Mary Bilyeu, the blogger at Food Floozie for this guest post. Look for her on Twitter and Facebook, too! It's fall, and cold weather has started to creep into Michigan. The leaves are gorgeous shades of red and orange and yellow ... cider mills, offering their cinnamon-coated doughnuts, welcome families ... baseball play-offs are in full swing (couldn't help myself!) ... and we get nightly "cuddle alerts" from a local weather forecaster. In other words, it's time to bring out an old favorite recipe: Barm Bread. This is an Irish treat, traditionally served at Hallowe'en; but it's lovely at any time when there's a chill in the air, because a hot cup of tea or cocoa is the perfect accompaniment. Usually a yeast bread, this is a quicker version that relies upon baking powder. According to Wikipedia: "In Ireland it is sometimes called Bairín Breac .... This may be from the Irish word bairín - a loaf - and breac - speckled (due to the raisins in it), hence it means a speckled loaf (a similar etymology to the Welsh bara brith)." Regardless of the language, the occasion it's served for, or any other variable, this is just a fabulous sweet, spicy bread! Featuring dried fruits, it's perfect when the fresh bounty of summer is tapering off. Basic ingredients that store well can be kept in the pantry for when the inspiration to prepare a loaf of this treat strikes you. And you can definitely make this your own by varying the fruits and the flavor of tea in which they macerate. Toast a slice of bread, schmear it with butter, offer a nice cuppa something warm and cozy, and enjoy! Preheat oven to 350F. Generously grease an 8"x 4" loaf pan. In a large bowl, combine apples, dates, raisins, brown sugar, and tea; let rest 8 hours or overnight. Stir egg into fruit mixture. Combine whole wheat flour, flour, ginger, cinnamon, and salt; stir into fruit, then pour batter into prepared pan. Sprinkle top of batter with the sugar. Bake for 1 hour and 15 minutes until a skewer inserted into the center comes out clean. Let bread cool, then turn out of the pan. A guest post from Toni at Boulder Locavore. As the sweltering heat of summer turns to the chill of fall, it’s usually a signal for me to start turning the bounty of the harvest into goods for winter. A few years ago I got a wild hair to see if I could eat over a Colorado winter sourcing the protein and produce I ate only from a Michael-Pollan-100 mile radius. I dove headlong into food keeping practices such as canning, freezing, dehydrating and root cellaring. Quite frankly I canned so many tomatoes my first year (150 pounds to be exact) I never wanted to see anything made with tomatoes again for a long time! As luck would have it, around that time I discovered Tomatillos. Odd little things, I was not sure if they were fruit or vegetables, let alone what to do with them. 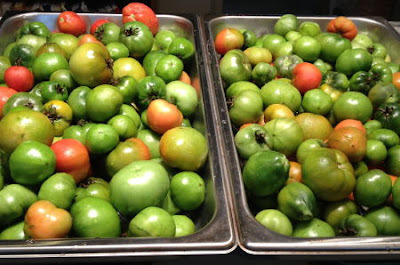 Loving a challenge and new discovery I spent some time chatting with the farmers at the local Farmer’s Market about what the heck a person would do with tomatillos; which is when I learned they are used in a number of different sauces and salsas. Since then I have run into them everywhere but I was not even sure what they would taste like upon first casting my eyes on them. Determined to make something delicious I settled on a roasted salsa. It was simple and straightforward with a wonderful end flavor which has become a favorite in my household. The tomatillos bear a light, sweet quality, as you’d identify in a tomato (though the overall flavor is different than a tomato) and they blend perfectly with the spicy heat of the chilies. This salsa is great for enjoying simply with chips or would make a beautiful sauce on grilled meats as well. I have frozen the salsa too (in much more civilized amounts than the tomato endeavor) with great results when thawing to enjoy during the winter months. This salsa is a unique blend of spicy and sweet, along with more traditional salsa flavor notes of cilantro and onion, and could not be simpler to make. Try to use peppers that are red to add some color contrast to the visual of the salsa! *A note on handling chilies; whenever handling spicy chilies like those in this recipe I highly recommend using gloves. The oil from the chilies travels easily on the skin and getting it in your eyes, nose or mouth is something to be avoided! 1. Preheat the broiler. Line two cookie sheets with foil. 2. 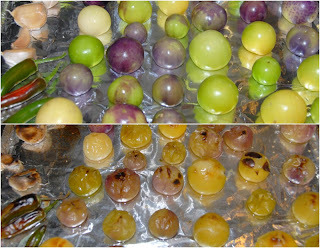 Husk the tomatillos and rinse them. Note: their skin has a tacky feel which will not rinse off completely. 3. Place tomatillos, chilies and the unpeeled garlic cloves on the cookie sheet. Put them under the broiler checking them every few minutes until they char (approximately 7-10 minutes for the tomatillos and faster for the chilies). If the chilies char first, remove them, set aside and allow the rest of the ingredients to complete roasting. 4. While other ingredients are broiling, peel and cut the onion into large chunks and put it into the food processor bowl or blender to await the rest of the ingredients. 5. When the tomatillos are done roasting let them cool until able to be handles and place them into the food processor bowl. Squeeze the contents of the garlic cloves into the food processor bowl ensuring the peel does not go into the salsa. Toss in the cilantro and salt. Process all ingredients until reaching a pureed salsa consistency. Enjoy! Like this post? Want more? Don't forget to stop by Boulder Locavore for more recipes! It's not just for Boulder locals, it's a food blog for everyone who wants to cook and eat fresh, local, seasonal, and delicious food. And Toni is a real sweetheart. You'll love her blog, I'm sure. "Roast peppers directly over the flame of a gas-stove burner." There's no recipe instruction I love reading more than that. It's elemental not only in the FIRE! FIRE! FIRE! sense but also in its simplicity. No pans required, no other ingredients necessary. Just blacken that pepper all over, throw it in a paper bag to steam and loosen its skin, and then rub away the charred surface. The process is deeply sensuous, too. The sound of gas rushes through the burner before the ignitor sparks to life. Click-click-click-click-WHOOSH. A blue halo of flame dances below the grate. Above, a plump, bright-red pepper hisses, spits, and crackles as it chars. An earthy aroma fills the kitchen, and sparks ride the updraft as tongs jostle ashes loose from the skin. A coal-black pepper looks absolutely ruined after a few minutes, but as you remove it from the bag and rub off the skin, you reveal the transformed flesh below, now deep-red, tender, and sweet. Mine most often find their way onto a pizza or two, but they're great on sandwiches, in omelets, in pasta, you name it. 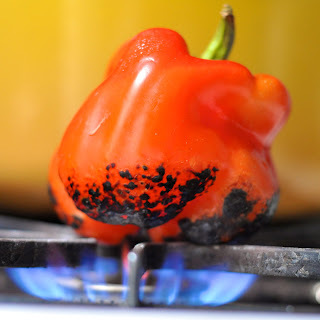 Roasted peppers, to me, are so delicious that this simple method almost feels like a cheat. I learned this "trick" so long ago that I sometimes forget how magical it can seem. And how liberating—it's like an indoor open campfire. I mentioned this over Twitter once, and folks suggested toasting marshmallows or making s'mores in the same way. Or warming tortillas directly on the grate. It makes me wonder what else I could use this method for—and what other simple tricks like this I've overlooked. If only every recipe could begin this way. Bob, the year I met him. Before you read the rest of this, let me assure you that my husband is getting better. But that wasn't the prognosis three weeks ago, on September 26, when a doctor and his staff called me in for a meeting. I had a knot in my stomach on the way to the hospital, and the knot got a little bigger when I saw a few too many un-cheerful faces. In the meeting, the doctor droned on for what seemed like an hour about all the things that were wrong with my husband. A whole litany of organs weren't doing well. On top of everything else, he hadn't woken up since they took him off sedation. His gut wasn't working, so they couldn't feed him. He couldn't breathe on his own. He needed too many medications just to stay stable. The doctor finished his monologue by saying they didn't expect him to get better and that the best they could do is keep him comfortable. There was no chance he'd improve. There was no hope. I choked out, "how long does he have?" and the doctor said it could be a few days or a few months, but it was up to me, because I could schedule a time ... Hearing that was just about more than I could bear. There are seven stages of grief, and I went through all of them simultaneously. Then I started over again. I was swinging from being an emotional puddle to being completely rational and logical. I cried buckets of tears and gasped and howled and hyperventilated and whimpered. I went to my in-laws house to tell them their son wasn't going to make it. Or, really, I just collapsed in their doorway. I spent several hours informing the rest of my husband's family by phone, one after the other. Then I went back to the hospital for a while to say a few words to my husband and hold his hand. Then I came home to take my elderly dog to the vet. I'd made the appointment the day before, after she'd hurt herself while I was out. She had been trying to get up from a nap, but couldn't do it on her own and had managed to snag a dew claw and bleed all over the floor. So I made an appointment at the vet, and brought her in on the day I was told my husband wasn't going to make it. I was a wreck. I had hoped I could keep my furry companion around for a little longer, but she let me know it was her time to go. All I could think of was that at least when my husband got to the other side there would be a wet nose and wagging tail to guide him on his way. It was the single worst day of my life. I spent the night tossing and turning. You think of strange things at a time like that. Towards morning I dozed off, but was awakened by a call from the hospital. Bob had suddenly taken a turn for the better. His eyes were open, he was responding to commands, and they had taken him off most of the medications he was on. His vital signs were good without any help. It took me a while to process all of that. To realize it wasn't some sort of dream. To realize that the day before wasn't a nightmare. To rekindle that glimmer of hope that the doctor had extinguished with the certainty of his diagnosis. Back at the hospital, everyone was all smiles again, and plans were being made for Bob's continued care with a renewed commitment towards recovery. I was exhausted and elated. This time, informing the family was a much more pleasant task. If my life was a made-for-TV movie, there would be a scene with Bob moving towards the light and a black dog growling and snarling and not letting him past. Bob finally gives in and wakes up. The dog smiles, wags her tail, and leaps into the light. And all is well. Credits roll. But my life is not a TV movie. And we're not anywhere near the end of this story. Since that day, Bob has been improving. Slowly, for sure, and he's got a long way to go. But now the focus is beginning to turn towards rehab. He's still got medical issues - a surgical wound needs to finish healing, and he's got a persistent lung infection. But these are things that can be fixed. He is being weaned off the ventilator and is doing well, but it tires him out a lot. They've inserted a feeding tube and have removed the IV feeding. They have started re-training him how to swallow - first with ice chips, with the hope that he'll be able to being taking food soon. The therapists are working with him to get his muscles working again. He's getting movement back, but he has very little strength. A helium balloon could win in an arm-wrestling match. Some days there is significant progress, some days there is just a little. Some days, he's just plain tired. But he is moving in the right general direction. For someone who was supposed to have a few days left, he's doing amazingly well. For someone who drove himself to the doctor because he wasn't hungry, he's in pretty lousy shape. Did I mention that this is going to be a long recovery? I don't mean long in terms of weeks. I mean months. Bob will not be home soon. When he gets released from the hospital because his medical issues are fixed, it's likely he will be transferred to a long-term rehab facility. It will be a long time before he is home again.. I've been pretty public about my husband's medical condition, but the one thing I haven't mentioned is ... insurance. Or lack thereof. It's not quite as bad as it seems. I won't be homeless. I won't starve. But it's going to be incredibly sucky for a while. The good news is that my husband has been in the hospital long enough to qualify for medical financial aid. When that's good news, you know things are pretty lousy, right? The bad news is that my husband hasn't earned any income since he went into the hospital on September 6, and he's not going to be making any money in the foreseeable future. I can hear some of you thinking, "unemployment" but you don't qualify for unemployment unless you're actively looking for work. I can guarantee you that my husband hasn't been sending out resumes from his hospital bed. I am filing to gt my husband on disability and hoping for the best. I've been told that it can take several months before a decision is made, and that they might deny us on the first time around, and I might need to hire a lawyer to appeal. Maybe things will happen faster. Maybe not. I hate asking for help, I hate the idea of taking handouts ... but the other option is eventual bankruptcy, and that's something I like even less. By taking the financial aid, the hospital and doctors will get paid. With bankruptcy, the hospital and doctors will get stiffed. I'd rather see them get paid. I'll take the aid and find a way to pay the rest. So, long term, we'll probably be fine. A few years from now, it will be nothing but a bad memory. It's not just my husband's income that's an issue. I've taken some time off of work, so my income has been greatly reduced. Not to mention that I'm mentally exhausted, emotionally fragile, and usually sleep-deprived. I know I need to start making more money, but it's going to take some time before I'm up to full speed again. Short term, the money for paying everyday bills will be running low pretty quickly. I know I can borrow, but I don't want to borrow money that I might not be able to pay back. So, I'm gonna go the beggar's route and put up a PayPal button and if anyone wants to chip in, I will be forever grateful. Note: if you've been here before you might notice that the Donate button is now a Pay Now button ... PayPal has rules about donations, and I didn't want to run afoul of them. What are you buying? A great big heartfelt THANK YOU! If this is something you don't want to do, that's perfectly fine. I honestly don't expect it. I'm just putting it up there so those who want to, can. If I had the energy, I would run a bake sale or raffle off stuff, or sell an e-book, but at the end of every day I run out of time and energy before I run out of things I should have done. So, no baked goods for you. Maybe later. Please note, too, that this is not a tax-deductible donation - I am not a charity. This is more like me standing on the corner with a tin cup. Or however you want to picture that. Please, if your situation is worse than mine, mentally, physically, emotionally, or financially, don't even think about donating. We all have out own needs, and I know that there are many, many people worse off than I am. And if you have any doubt whatsoever about the truth of my situation, please don't think about donating. Like I said, I won't end up homeless. I won't starve. I won't rob a liquor store. But rest assured, if you do donate, the money won't be used to pay for illegal drugs or hookers. Unless you consider gas and electric illegal drugs or you think the insurance company is run by hookers. Which I guess is possible. But, nah, not likely. This whole situation has really changed my attitude about a lot of things. In many ways, it has made me see things in a more positive light as I celebrate each small improvement in my husband's condition and appreciate the time I share with him. It has also highlighted the fact that money certainly isn't everything. All I really want is for my husband to come home to me, healthy. I'd sort of like to have a home for him to come home to, but I don't care if I never have another new car or a vacation or a latte at Starbucks. None of those things are necessary for happiness. There will, however, be much joy on the day my husband comes home, and much happiness with each step he takes on that long journey to get here. If you do donate, thank you from the bottom of my heart. When I am in a position to do so, I will return the favor.